It was really good to work with Tracey Rickard on my website. She listened to what I wanted to achieve and produced an excellent user friendly design for the site. Her customer service was excellent, guiding me through the processes that then enabled me to update the website myself. I am very pleased with the finished product and would highly recommend her. Kristina Gray is an author of children’s books and she is based in Warwickshire. 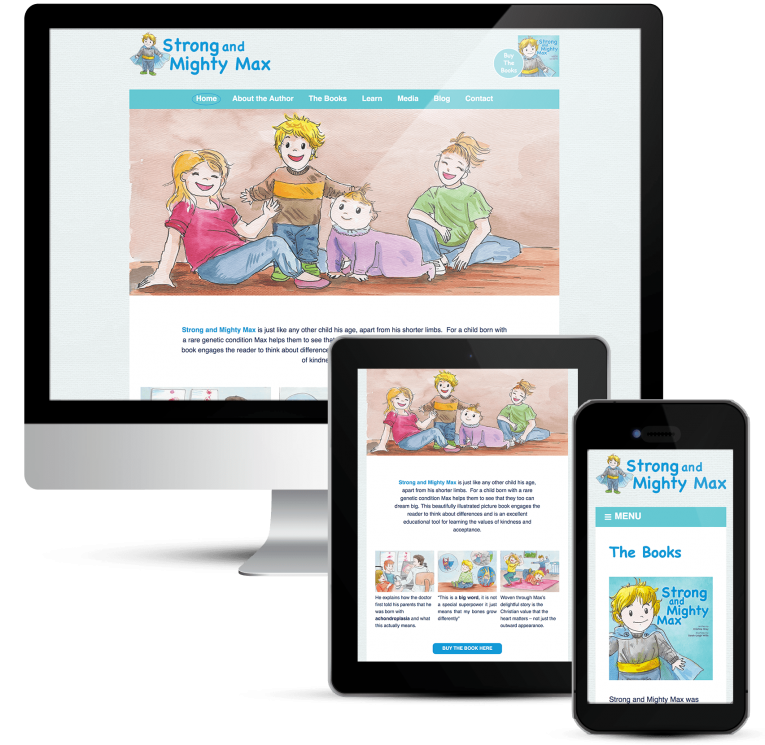 The lead character in the story, Max, is based on Kristina’s son Samuel, who was born with a rare condition, achondroplasia, the most common form of dwarfism. When Samuel was born, Kristina quickly learnt that his biggest challenge in life would be other people’s perceptions of him based on presentations of dwarfism in the media and culture. As a result of this she decided to write a children’s story that would help to educate his peers about his condition and provide a positive role model for children born with rare conditions. I read some heartbreaking articles about prejudice towards people, even children, who are a litte bit different and I was genuinely surprised that this still goes on today. Thankfully people like Kristina are doing a great job to educate people and persuade them to open their minds. Kristina is a lovely person with a great ability to communicate with children through storytelling. She works hard to communicate though all kinds of media and has been extremely successful in getting her story out. It is so pleasing to know that she has the support of famous people including sporting celebrities Ellie Simmonds and Jahmani Swanson, not to mention her profile raising interviews on the BBC and Midlands Today. Kristina a pleasure to work with but at the same time I was lucky to be able to feature beautiful images from The Happy Designer. All in all this website was an absolute pleasure to do and a project I will always look back on fondly.